National 145 reading "Coins Only"
With door open, display reads "Coins Only"
I have the bill validator spliced together. Some of the wires have more than one color -- there are two sets of purple and orange wires and two sets of gray wires that have a white, red, and coaxial type wire inside of it. I am not sure if I have them spliced together correctly. Right now the bill validator doesn't do anything. No lights, no power, nothing. And the problem I have with the blank display does not change whether or not I have the validator hooked up. I think it might be a bad door switch. It doesn't matter if I manually hold the switch, bypass the switch with jumpers or have the door activate the switch. If the switch is pressed in, the display is blank, but will accept coins. With the switch not pressed in, it will read "coins only" with the door open and not register coins. So my question is one, where do I get a replacement switch? I have looked and can't find one that seems to work. And two, is there something else it might be? My current plan is to have coins only and not use the bill validator at all. I have a change machine in the store, so getting quarters is no big deal. 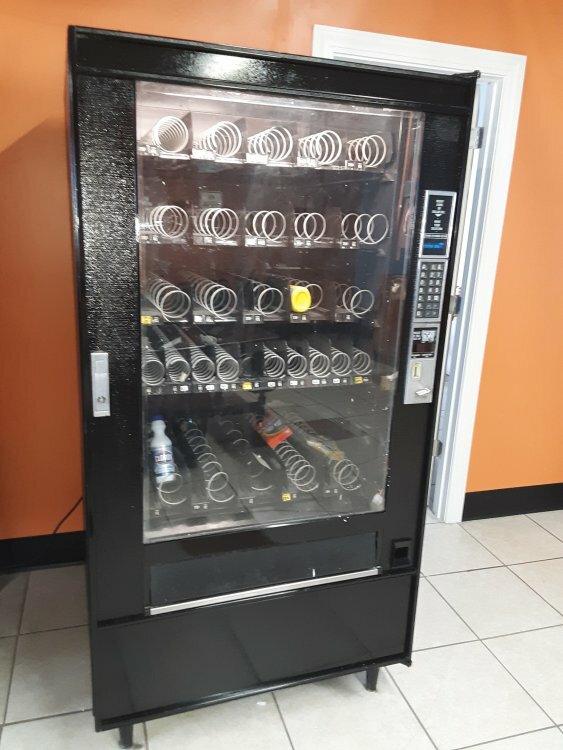 Right now it works when the door is closed, but with a blank display I seriously doubt anybody is going to put coins in to see if its on or not. All my older APs have a blank display until money is put into the machine. The door being open let’s it go into service mode, so it shouldn’t be taking any coins. That’s when it allows you to make price changes. It sounds like the machine takes money & vends product & returns any extra change when the door is closed. If that’s correct then the door switch is working correctly so I’m not sure what the issue is. Please clarify if I missed something. You didn't miss anything. That just sounds really odd. So a functioning 145 has a blank screen until you either put money in or make a selection to see the price? I guess I was expecting it to display something all the time. With that out of the way, does anybody have any suggestions as to why my bill validator is unresponsive. I have about 40 wires spliced together but can't get it to do anything. Yes, I agree. It was some of the very first snack machines out there. Can you send a picture of the validator & wiring harness? The 145 display won't be on until a coin is deposited so its working fine. Your validator is a Maka POS so don't even try to make it work. Put a light in the top of the door so the customer knows the machine is on. SA - your machines must all be ollllllddddd though if they are AP7600s they are great machines. They are the only other ones that have to have money inserted to turn the display on. Oh yeah man, I think I have one 145 and then some 4000s. Found an mdb update kit for cheap and put on one and works fantastic with card reader. As you can see it won't sell the product you wish to sell. There are no spirals available for it that would work for those packages. 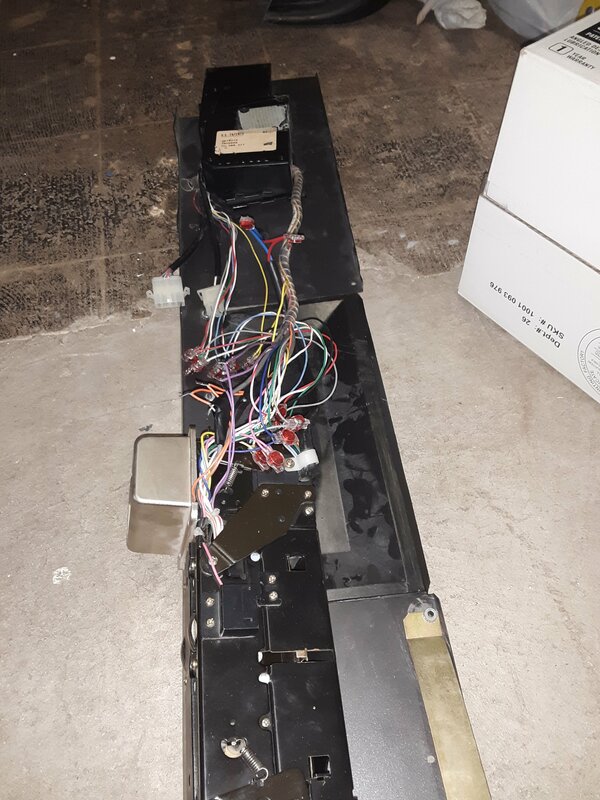 The forum will only let me post one picture a day, so here is my mangled bill validator. Helpful info would be if anybody knew which wires are power and neutral so I can test it with power going to it. Of course nobody makes spirals big enough. It is proving to take some time and patience but I'm pretty close to getting it to consistently vend everything I want in there. Take spirals out, pull on them, cut off extra spiral, test, repeat, etc. Does anybody know where I can buy the spacers and divider plates to hold things better? The divider plates run from front to back on the trays and make the columns smaller. I can probably make some, but would be easier if somebody sold them. one of the more seasoned guys migt give you a better idea. Snack Attack also has those spacer. He has the cable on eBay that I sent you.